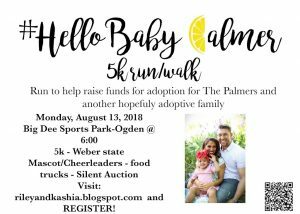 We are so excited to announce the first annual #HelloBabyPalmer 5k run/walk!!!! We are hoping (hence the annual part) to do this every year to help another adopting family. So, let’s make this year successful by sharing the news with EVERYONE!! Registration is now open to everyone. Yep, we are allowing out of state runners/walkers to register and run in their hometown. We will be sending you a #HelloBabyPalmer shirt to say thank you. We are hoping you’ll get a few of your friends to run beside you to help with this amazing cause! We are so lucky to have some incredible food trucks, games, and Weber State Cheerleaders and Mascot joining us that day. It seriously is going to be so much fun! So bring your mom, grandpa, dogs, ANYONE!